This week saw the body finally move offsite to the bodyshop where it will be receiving the final work done in preparation for paint and then reassembly. Just to remind you about what happened. I made a decision a few years back to essentially scrap the Eleanor idea. Instead, I’ve decided to restore the car back to an original GT500, with a few tweaks. The car is now receiving some last body work and fitment of the GT500 body kit. Something I’ve been through before, years back with the Eleanor kit. Most of the Eleanor parts have been sold off meaning I haven’t lost out too much. Hopefully more frequent updates to come as over the last year we have bought SO many parts including a brand new 390HP Blueprint Crate engine, Tremec 5-Speed, performance fuel tank, MSD digital ignition, Holley Sniper, pulley kits and we even had Autometer create us some custom made Shelby Signature gauges, like the ones used on the original Unique Performance cars. I know I just bought the Classic Instruments versions though when the Autometer opportunity came up I just couldn’t resist! Stay tuned! © 2019, 67mustangblog.com. All rights reserved. What a difference a week makes. Just a short update to show you what we’ve just got back from the powder coaters. I’ve just got the coated seats back along with the diff and rear seat panels. It’s all coming together quite quickly now. Still a long way to go and a lot of parts needing attention and assembly. As for these seats I’ve got a nice set of 1967 deluxe upholstery that is going to go on them. Also, i luckily managed to buy and store original 1967 hard seat backs in black with the trim, some will know how rare they are especially since they aren’t cracked. The one issue we’ve encountered is the listing wire. The original ones being far too gone to be reused so we’re having to look around to see if we can find any. If you know where to get some 1967 Mustang upholstery listing wires let me know. In the meantime, stay tuned! © 2018, 67mustangblog.com. All rights reserved. Good news this past week. The car has been sent out to the body and panel guys for the last bit of work before the long task of putting her together begins. So that means all the smaller jobs need starting, one of which is restoring the old seats. As you can see the original seats aren’t in the best of shape. The frames were bent and broken possibly due to a heavy previous owner perhaps?. So we’ve stripped them all, straightened the frames and welded up the cracks. Once we strip the rear seats they will go off to the powder coaters to get recoated, along with the Diff housing and a few other bits and pieces that need doing. All the tracks will need to be cleaned up as well and painted. Some of the bolts are a bit cross threaded so we’ll replace them and get them recoated as well. After all that we have some nice brand new deluxe upholstery to cover them all. It’s all happening! © 2018, 67mustangblog.com. All rights reserved. For the regular readers of this site you will know that the building of my car has been a feat that has taken the better part of a decade. 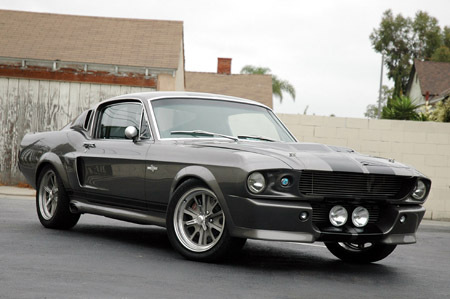 I’ve gone through the Eleanor love story and back again and am now setting my sights on a Shelby GT500 resto mod. Not long ago I received the Shelby GT500 front end. You can see it here. Then I managed to get a custom order Classic Instruments Shelby gauge set from Classic Recreations. Custom in the fact that it is metric (KPH). But now as the year begins we are fitting them up and they look rather good as you can see in the picture above. On a side note I am hoping this year to have things move thick and fast. I’m hoping to have the car finished or near to finished by this time next year. © 2018, 67mustangblog.com. All rights reserved. 2018 Shelby 1000 Track Car announced! It’s a little known fact that back in 1964 there was an independent rear suspension (IRS) designed for the Mustang by Carroll Shelby’s crew. It never eventuated, most probably due to budget constraits but the Original Crew who worked on the car has wondered all these years how well it would have worked. So they set about finding out. 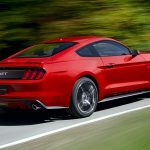 © 2017, 67mustangblog.com. All rights reserved.